Summary: This walk, just short of 10 miles is a gem. There are interesting features throughout the walk with the next one a short walk from the last. 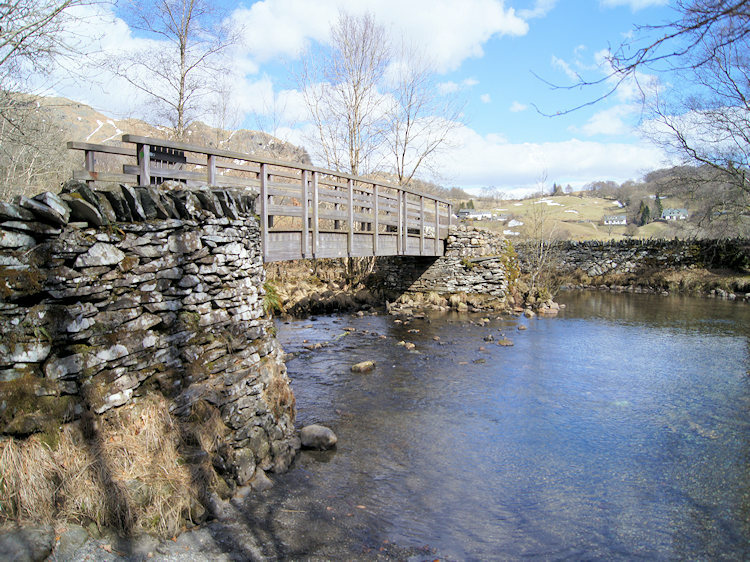 Starting from Glen Mary Bridge its a short walk to the lovely surroundings of Yew Tree Tarn and from the tarn the climb to Holme Fell is short and sharp through woodland and then open fell with erratics to look out for. 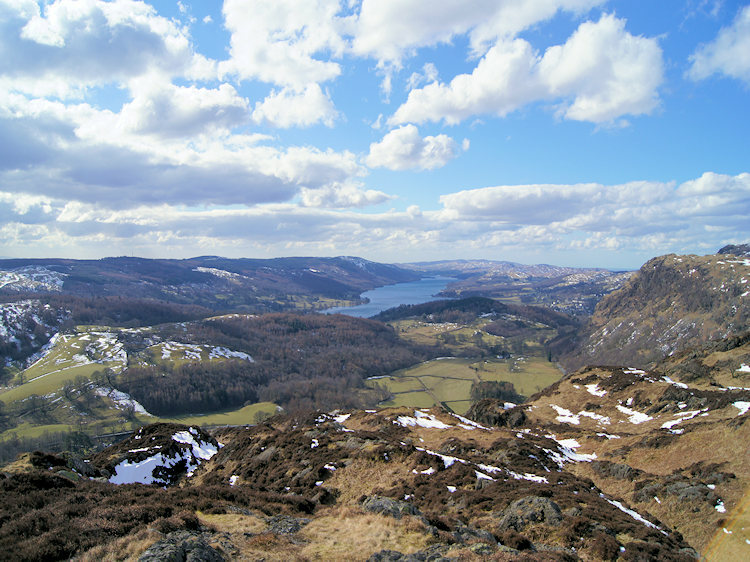 From Holme Fell the walk descends to disused slate quarries and Great Hole which cannot be missed. Afterwards the walk follows tracks through the sites of small quarries to Cathedral Cave near Slater Bridge. 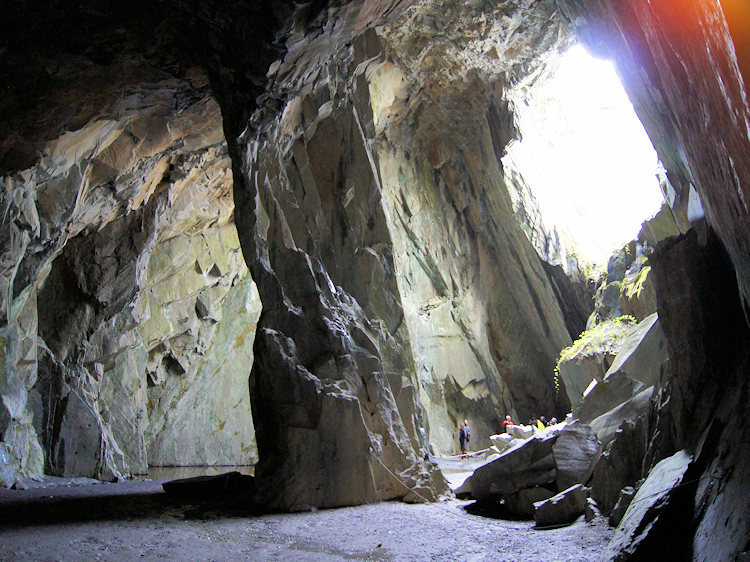 The cave is managed by the National Trust and is magnificent theatre. After the visit to Cathedral Cave the walk continues to Hollin Bank and on to Oxen Fell High Cross before following a farm road up to High Arnside and then to Black Crag on the summit of Black Fell which provides sight of the finish route to Tarn Hows and after the beautiful tarns back to Glen Mary Bridge via Lane Head Coppice which is home to a series of interesting waterfalls. 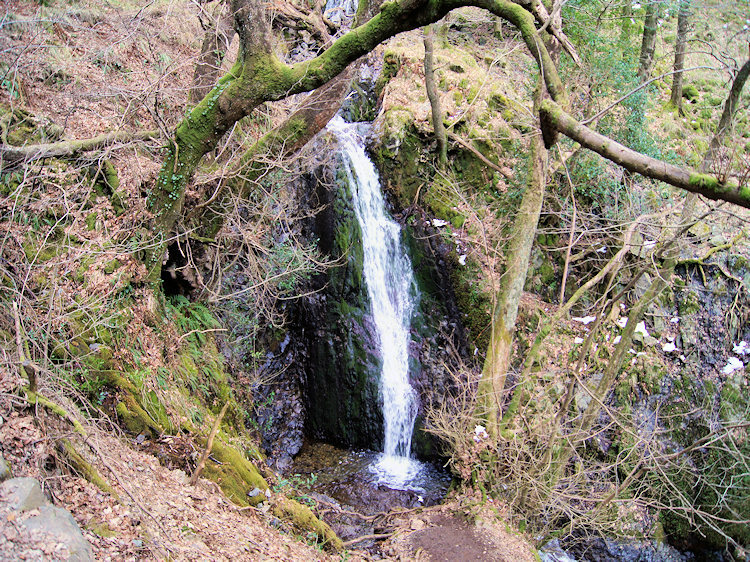 The Walk: I subscribe to Cumbria magazine and found a gem of a walk described in March 2013 edition. The summary for the walk described it as "full of interest and suitable for families" so I read on and found it included a couple of interesting features, namely 'Great Hole' and 'Cathedral Cave'. Reading on I looked at the map of the walk, noted there were two of Wainwright's lowest fells close by, in fact the 212th and 213th highest of all 214 fells in his pictorial guides and so designed this walk. 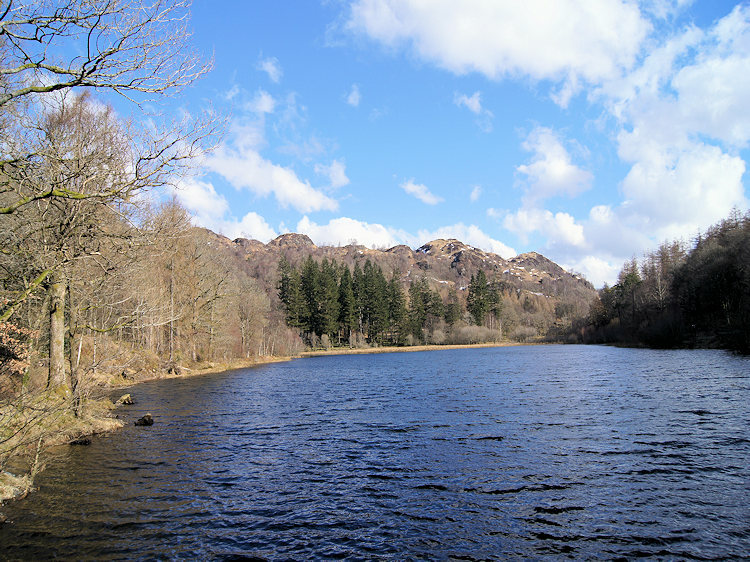 I also noted Tarn Hows were close by and having never been I added a detour to them too. So, with the route determined I made arrangements with my friend John Lister to meet at Glen Mary Bridge National Trust car park for a 9.30am start on an early April morning and having done so made my way to the car park where he was already waiting. John and I set off walking from Glen Mary Bridge in ebullient mood, a consequence of being out walking in the Lake District on a lovely crisp Spring morning. 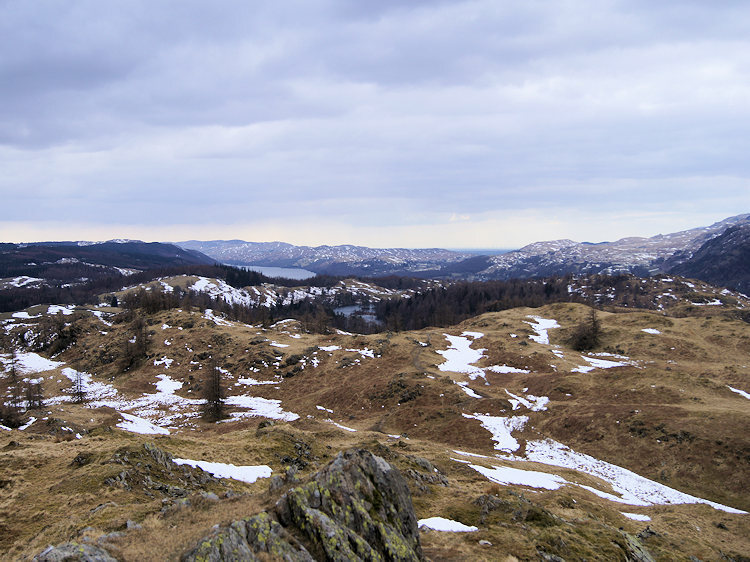 We walked north on a path running parallel to the A593 Ambleside to Coniston road for 400 metres before crossing the road and taking a path to the southern edge of Yew Tree Tarn. The tarn is not natural, being formed when the local landowner dammed the Yewdale Beck in the 1930s. The landowners work in blocking the beck to form the tarn has left us with as delightful setting; it is a lovely sight with woodland surrounding the tarn and the rocky heights of the Furness Fells close by. On walking through the delightful woodland skirting round the west side of the tarn John and I began our first climb of the day, firstly to Ivy Crag and then up the eastern side of Holme Fell by way of Uskdale Gap. 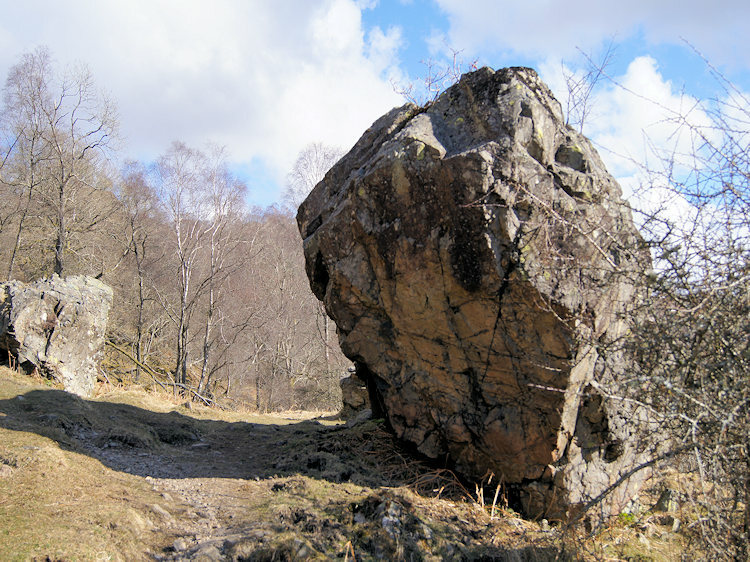 There were some interesting erratics (dispersed boulders) by the side of the path as we climbed. 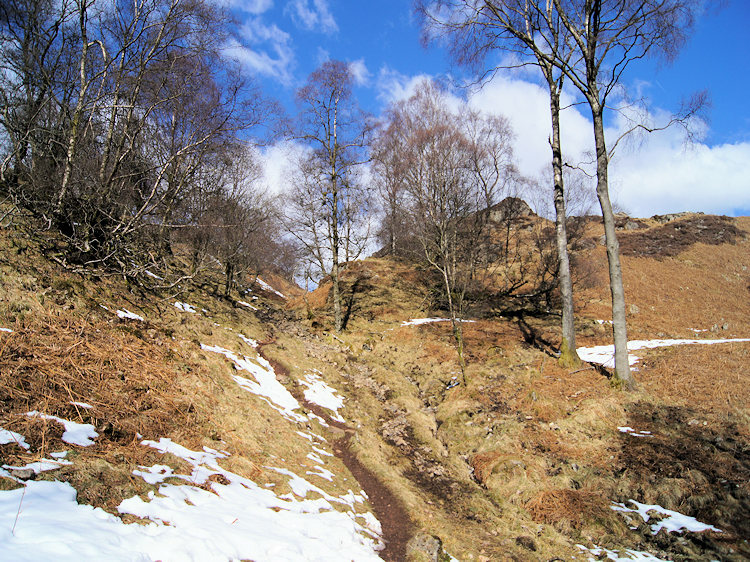 The climb of Holme Fell continued through the gap which was easy to follow, a short but challenging ascent which had me huffing and puffing my way up. I wanted to maintain a pace in practice for my Welsh north coast to south coast walk, 18 days across high ground starting with Snowdonia in just four weeks time. With the long walk in mind, the pace maintained, with short pauses for a sharp intake of breath, John and I were soon in sight of the summit of Holme Fell. 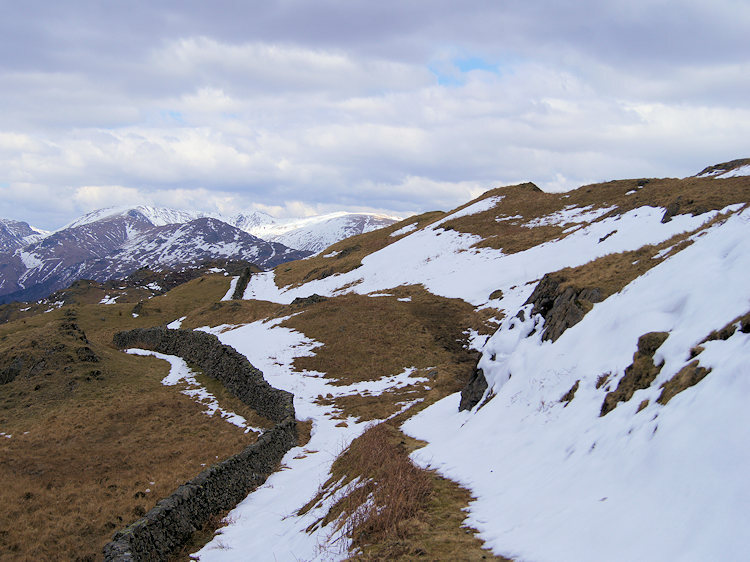 As we climbed to greater height the views rewarded our efforts and soon the impressive snow covered east flank of Wetherlam took most of my attention. In anticipation of more superb sights, I rushed the final yards to the top. 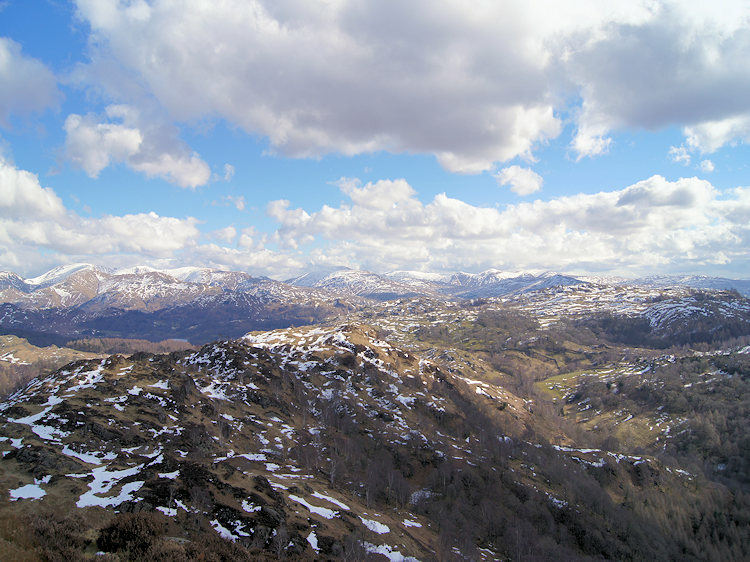 The moment of arrival on the summit of Holme Fell was memorable. I soon forgot I was short of breath as I looked around in awe. 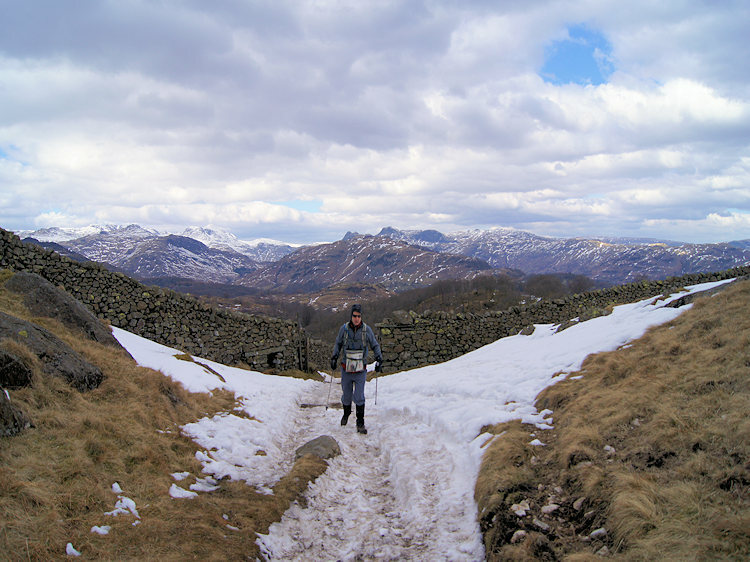 The northern aspect is particularly impressive with many of the Lake District's giants in view including the Langdale Pikes, Helvellyn, the ridges of the Fairfield Horseshoe, High Street and the Kentmere Fells. 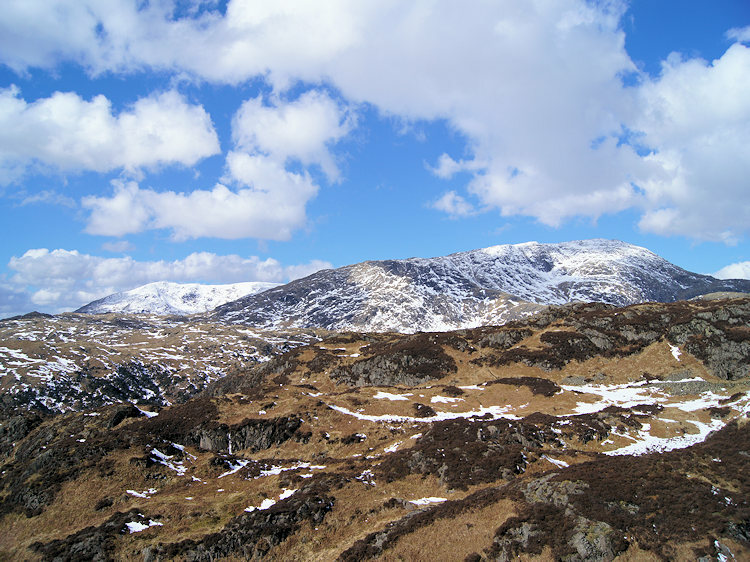 As for the southern aspect Wainwright summed it up by saying "Outstanding in a moderate view is the striking full length of Coniston Water; this is the best place for viewing the lake". In fact there are a number of lakes and tarns to be seen from the summit of Holme Fell including Tarn Hows, Torver Reservoir, Elterwater, Yew Tree Tarn and three small reservoirs left behind from mining activities in the Holme Fell and Tilberthwaite area, an area to where John and I were heading next. After getting our fill of the views Holme Fell had to offer we descended by a north west course to Holme Ground where we joined a track which took us towards Great Hole via some dispersed woodland. In the sheltered areas snow remained stubbornly in place after quite heavy snowfall the previous weekend which had been Easter weekend. We were now into April and still in anticipation of a late spring. 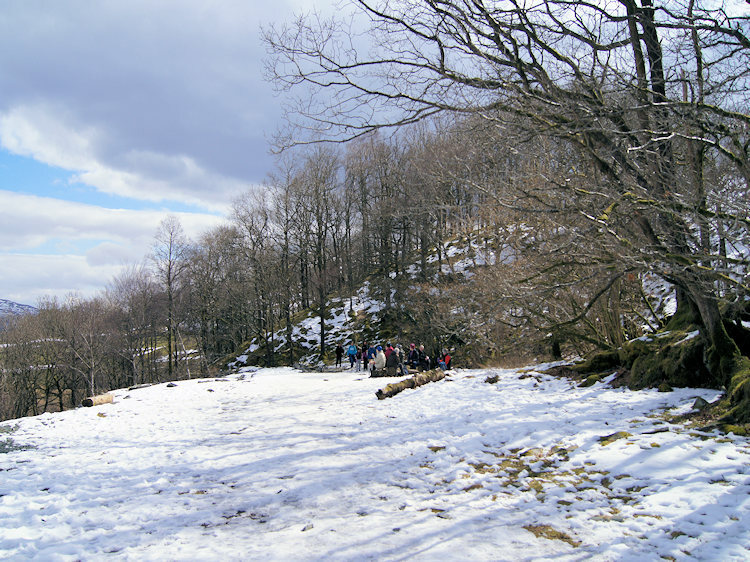 Despite the recent snow we made unimpeded progress on out walk; the paths were clear as shown in the photograph above right. As I mentioned at the start of this report I found the premise of this walk in Cumbria magazine and now John and I approached the first of two significant features described in the magazine. 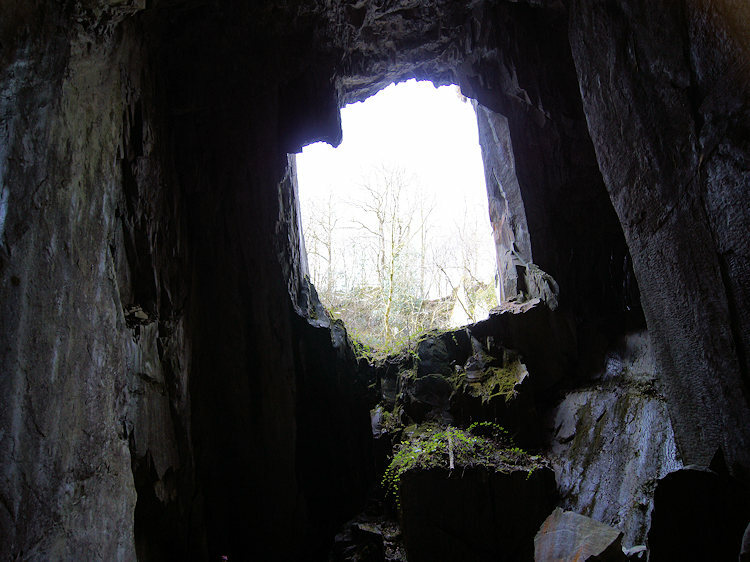 Soon we came to the 'Great Hole' in Hodge Close Quarry. 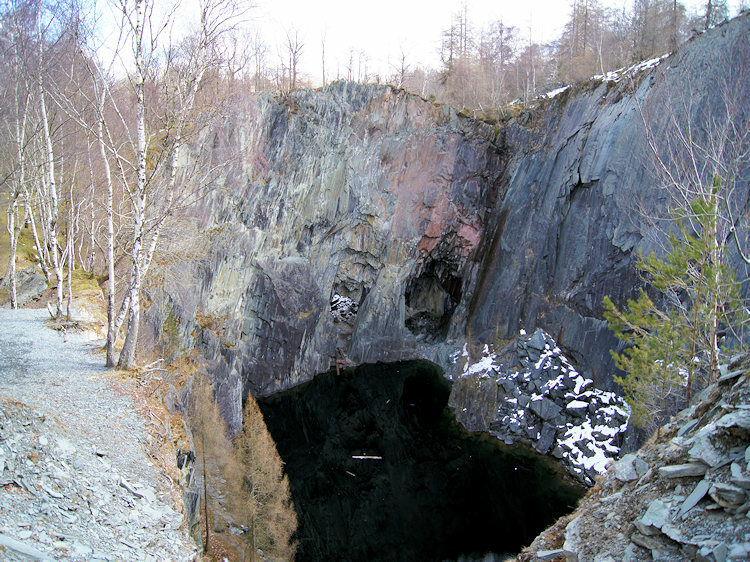 The great hole is a massive excavation of light green coloured slate, sheer-sided and unfenced, with an original worked depth from ground level of about 100m (300 feet). Apparently it is popular with abseilers and divers, participants in those extreme activities being absent as John and I took a leisurely circuit of the gaping hole - while we kept ourselves safely at distance from the edge. It was an impressive sight to behold as we walked round, there had clearly been some massive effort in extracting the green slate from here. After our circuit we left the hole and continued on our way through more sights of abandoned quarrying activity to Moss Rigg Wood just to our north. The walk so far had been full of interest and the theme of attracted attention continued unabated. 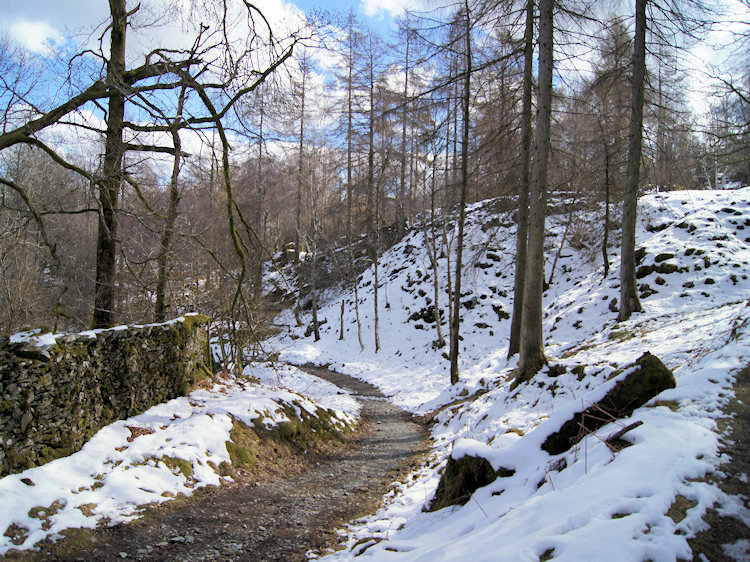 As we walked on the path north through Moss Rigg wood we came across the sites of more smaller quarries, ones that must have been an exploration exercise or a private enterprise for they were on a much smaller scale than that we witnesses at Great Hole. On arriving at Forc near Stand End we came to the fledgling River Brathey and here, near a wooden footbridge we took a short detour from our circular walk to explore the second feature described in the Cumbria magazine. We were near Cathedral Cave and in only a few yards from the footbridge we came to a National Trust sign leading us from the path to follow a track to the entrance to a man made tunnel. We had reached Cathedral Cave. Cathedral Cave is aptly named. 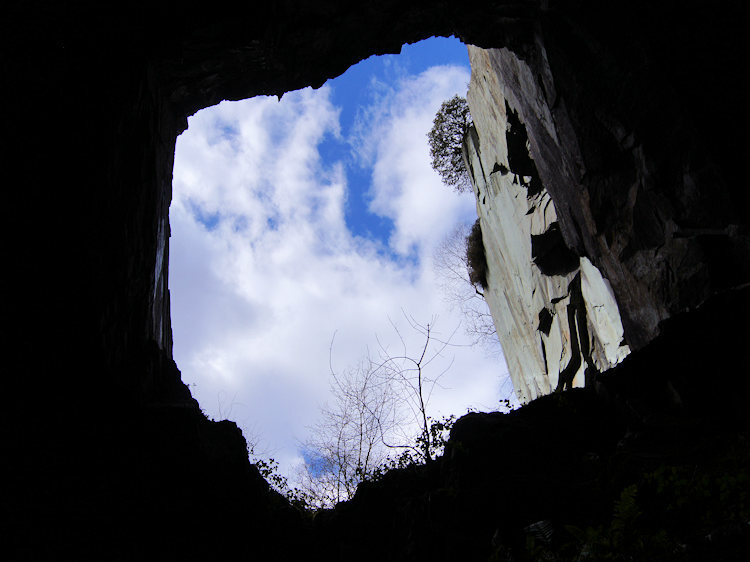 John and I walked through the short tunnel to the dramatic cave which has a central sloped slate column and the striking 'hole to the sky' which gives varying contrasting views to the outside depending on where you stand and look up. See my photographs which show one aspect through the window to nearby birch woodland and another which looks vertically up into the sky. as I looked up white clouds rushed by in the illuminating blue sky providing a constant changing scene. In the cave and near the central column there is also a red pool which is right beside the narrow path. Do not step in; I placed one of my poles into the water near the edge and it marked an appreciable depth. To step in would leave you very wet and embarrassed. We explored the angles and corners of the cave, took in the views of the quarried walls from different vantage points, at one point noticing an impressive straight cleft of rock strata near the left hand side of the exit tunnel. Then we departed the cathedral through the tunnel through which we had entered. After exiting the cave we took lunch on a conveniently felled log. Others were taking lunch nearby including a group of about a dozen mature walkers. As we took refreshment a couple stopped to chat with us, they too being impressed by the cave and the natural surroundings. It was a good day to be out. By now morning was turning to afternoon and the blue sky was being swathed in cloud. After finishing our break we left in to continue our walk in what were now increasingly overcast conditions. However it remained dry as we walked away, first by retracing our steps back to the wooden footbridge at Forc and then by continuing through a wood and along a path to Stang End where the path turned to road which we followed south and east for the next mile past High Park to Hollin Bank. 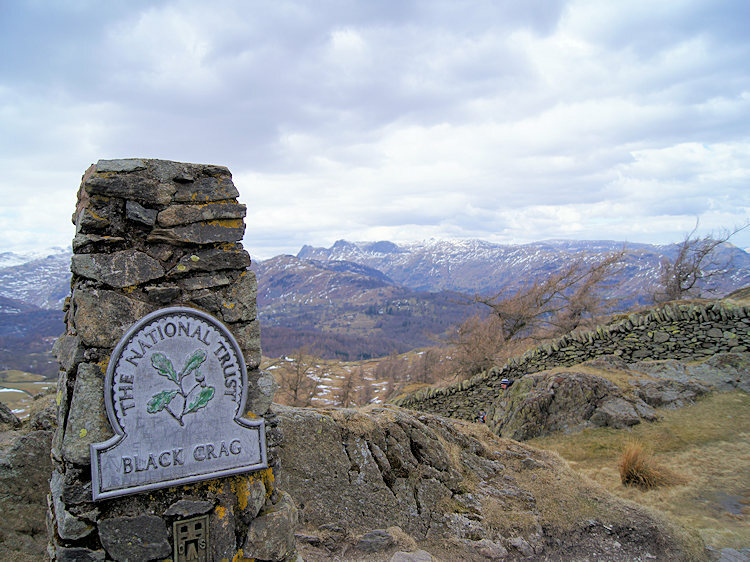 The climb to Black Crag on Black Fell was similar to the ascent of Holme Fell, if not as enclosed. 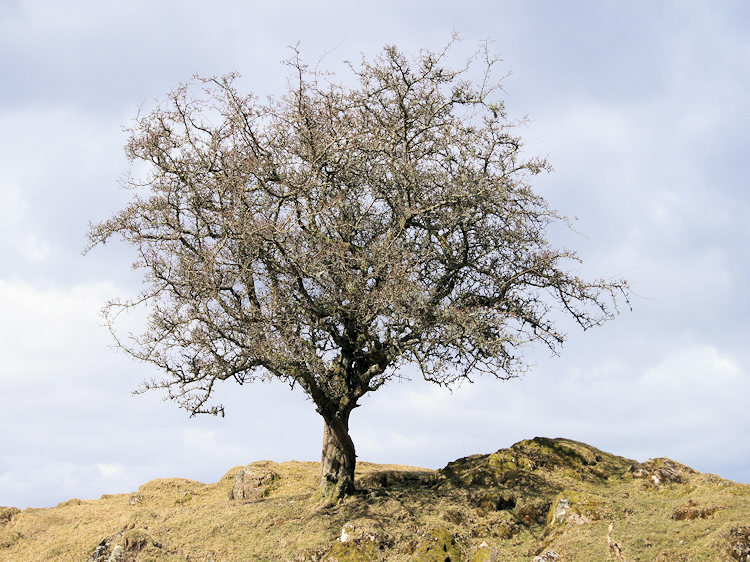 There was no woodland on this ascent, just the odd solitary tree. First our course was north east past Low Arnside to Arnside Intake and then it veered round to south east for the final approach in which a few exposed patches of remaining snow has to be walked through. 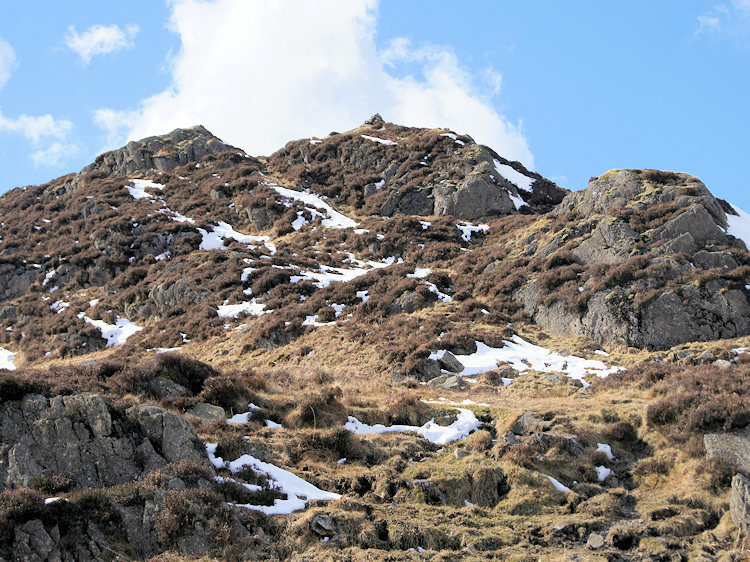 The ascent was a steady haul throughout and although longer than Holme Fell and to a slightly higher summit I found the climb much easier - I had walked into the walk so to speak. Having said that and looking at the elevation profile Holme Fell was the steeper ascent. Still, without abate and without stopping John and I reached the summit of Black Fell, defined by the trig point on Black Crag. I took in the view. I will let Wainwright describe what I saw. He says "The lovely countryside around the head of Windermere is delightfully pictured, this being the best viewpoint for the sylvan charms of the area between Ambleside, Wray Castle and Hawkshead" And so, in two Wainwright summits John and I have enjoyed, as he put it, the best view of Coniston Water from one and the best view of north Windermere from the other. Cannot be bad. The mountain views were not bad either. After drinking in the views from Black Fell which also indicated our way down to Tarn Hows we began our descent via Iron Keld and Torver Intake. 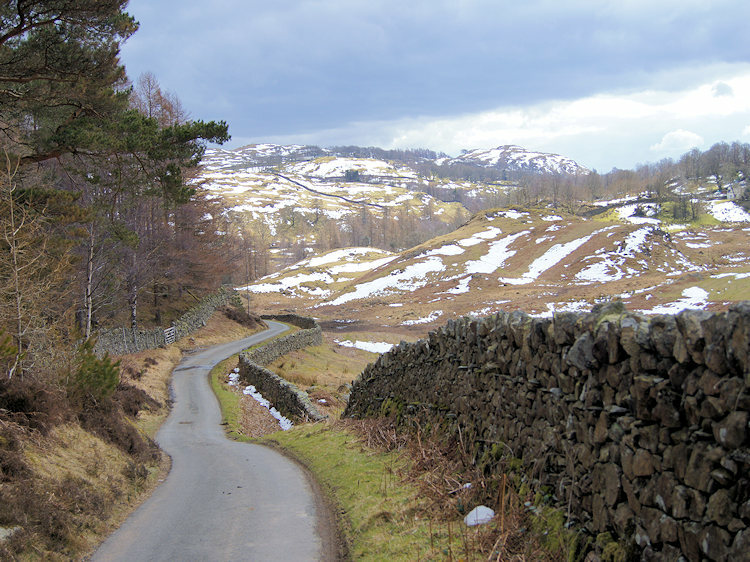 It was a careful descent at first, on the patches of snow in particular, and then in carefree abandon on a good path from Iron Keld through the plantation of the same name and then around Torver Intake which took us down to the northern edge of Tarn Hows. It was my first visit to Tarn Hows, one of the most popular tourist destinations in the area with over half a million visitors per year to the site. 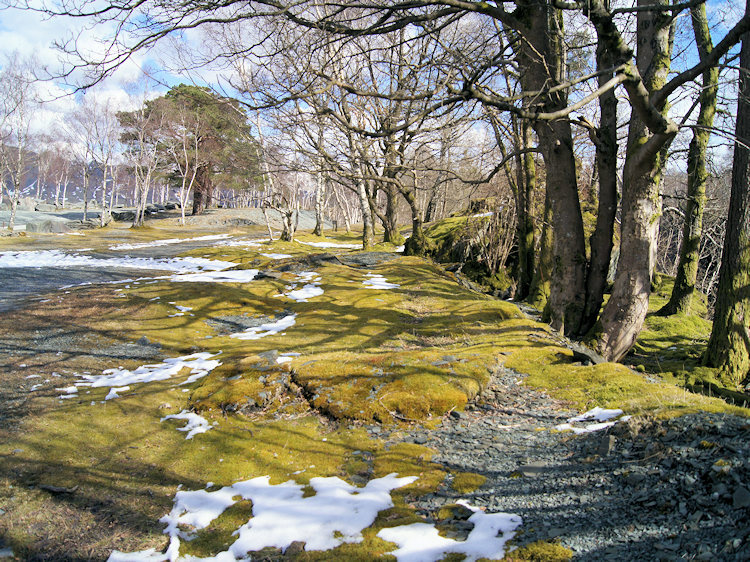 The reason for Tarn Hows popularity is clear as there are good paths all the way around the tarn, plenty of waterside spots for family picnics and woodland surrounding the waterside for children to play while adults rest. Indeed many family groups were enjoying a walk around the tarn as we walked. I stopped to take a family photograph of one lady with her two daughters who were dressed as bunny rabbits; it was Easter after all. 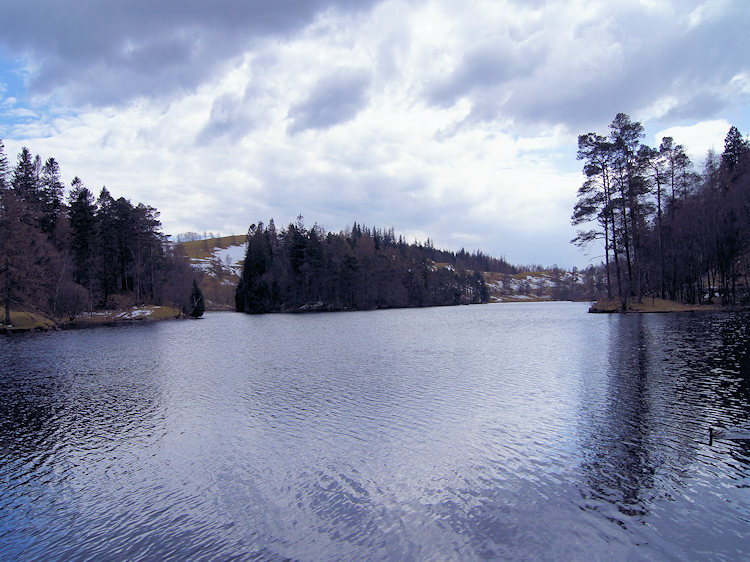 Tarn Hows is a lovely place, I have to concede it has an attractiveness to it, even on the cold dank afternoon we were now walking on - we even had the briefest of snow flurries as we walked along the waterside. 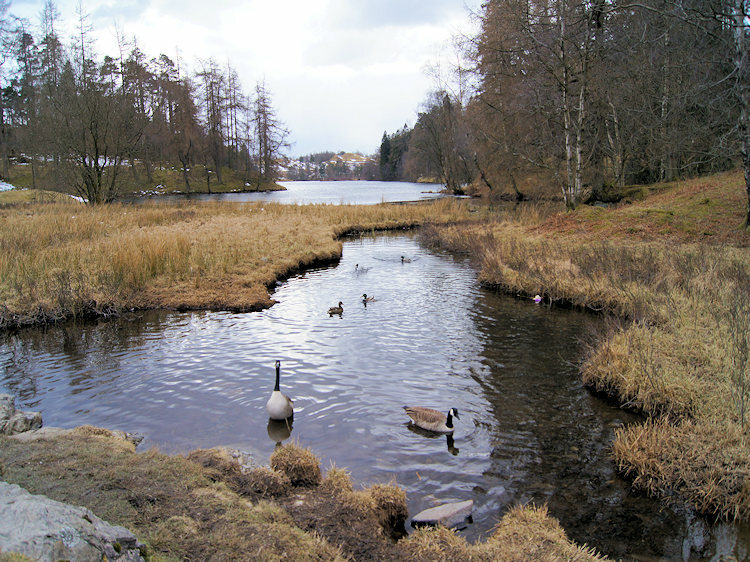 Geologically, Tarn Hows is fed at its northern end by a series of valley and basin mires and is drained by Tom Gill which cascades down over several small waterfalls to Glen Mary Bridge. As this is where I had left the car we followed Tom Gill down to the car park which had been renamed by John Ruskin who felt that Tom Gill required a more picturesque name and so gave the area the title 'Glen Mary'. It was a delightful finale to the most memorable walk. I lovely ever step of the ten miles, every single one. A WOW walk.